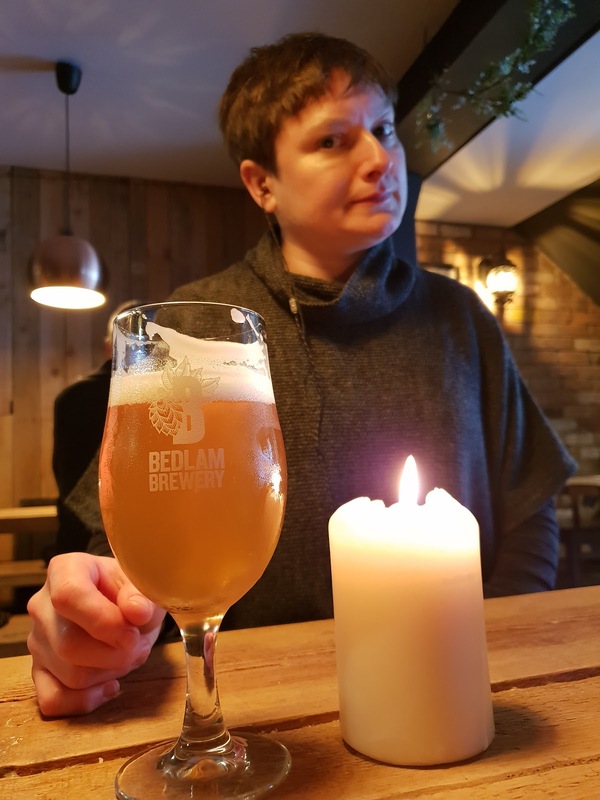 The first month of the year; traditionally a dreary slog of dark mornings and diets and dry January. And while it does sometimes feel like winter may never end, I’ve found myself enjoying the simple pleasures it also brings; racing to get home while it’s still light, flaming sunrises, snow days, the first daffodil. And, for the first time in a long time, feeling more like me. And that’s (mostly) a glorious thing. To punctuate the overwhelming greyness and to herald what I hope is going to be a cracking year, I also decided to book a weekend away in Worthing. 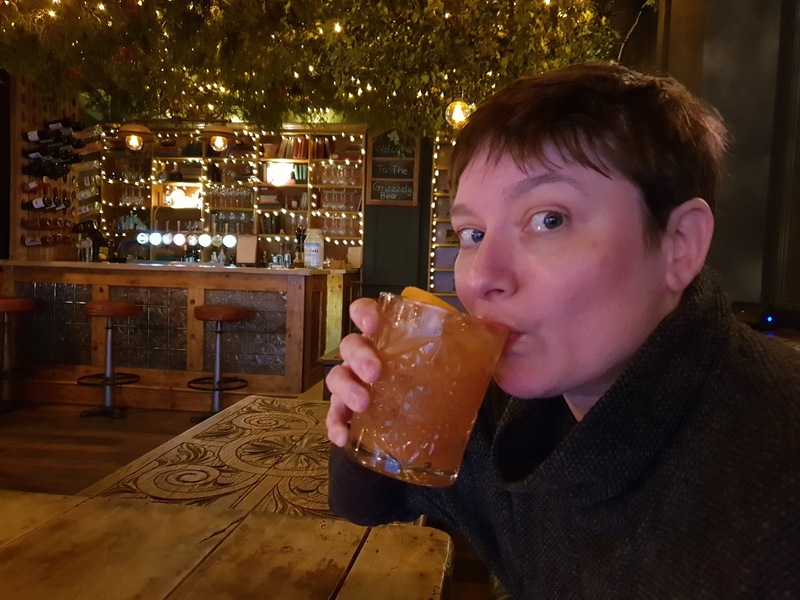 No real reason, just a random urge to get away, see the sea, walk on the pier and spend some time with the lovely Ewing, who normally feels far less enthusiastic about my plans but seemed (moderately) excited about this one. And if the idea of spending all that time with me wasn’t quite enough of a selling point, finding Worthing had seven micropubs and we were going to visit all of them after eating fish and chips on the beach was surely the clincher. Although I’m still not absolutely clear what constitutes a ‘micropub’ and I’m not sure our crawl made it that much clearer, according to the Micropub Association ‘is a small freehouse which listens to its customers, mainly serves cask ales, promotes conversation, shuns all forms of electronic entertainment and dabbles in traditional pub snacks.’ What’s not to like? Well, lack of ‘electronic entertainment’ might be a problem if you’re my wife and it’s the FA Cup 5th round weekend. A problem she negotiated by listening to the radio through one ear phone for most the afternoon. 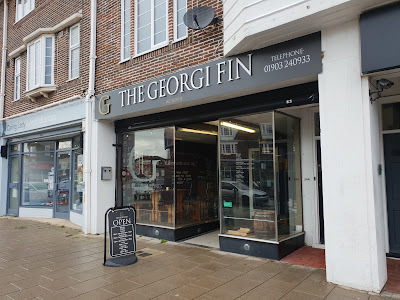 I did wonder why she seemed to be staring at me with particular interest at our first stop, the Georgi Fin in West Worthing, until I realised she was actually listening to Accrington Stanley Vs Derby County. 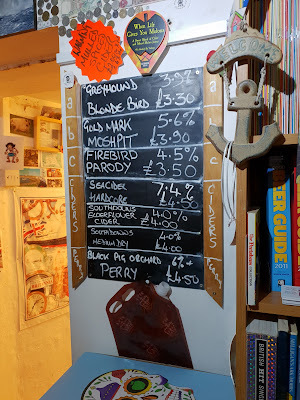 Thankfully I had my first drink of the day to keep me entertained which, after setting myself a challenge to only drink Sussex brews, was a pint of High Weald’s Chronicle (East Grinstead) at an eminently sensible 3.8%. Possibly verging towards triple B (boring brown bitter) in these Citra obsessed times, it was nevertheless a refreshing drop, bringing to mind something George Orwell might have supped while sitting by a coal fire and eating a plate of boiled turnips. Something we all might have to look forward to at the end of March…. 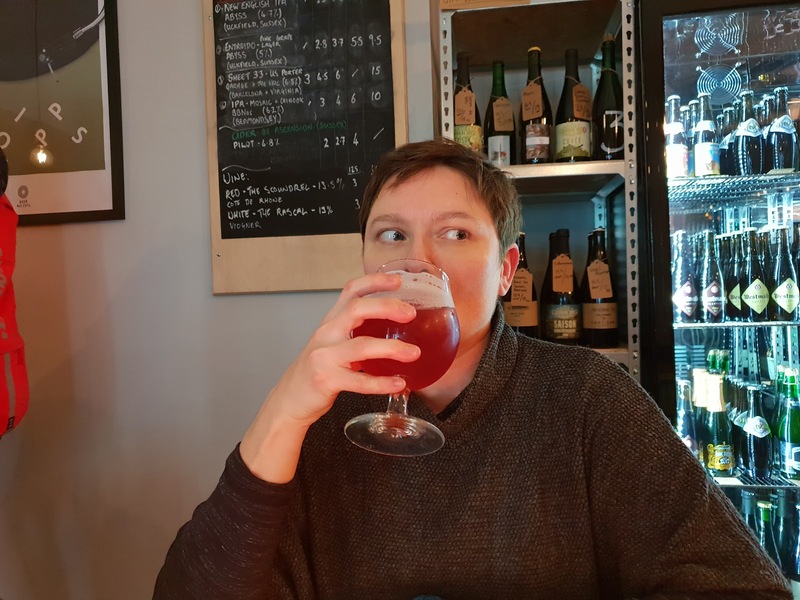 The Ewing went a little further afield with her choice of the Pig and Porter (just over the border in Tunbridge Wells) rowanberry saison. I think she enjoyed it, contrary to appearances. In fact the GF was a good start all round – a friendly place with a good range of six gravity dispensed cask beers and three on keg, plus local ciders, wines and spirits. We initially walked past the Green Man Ale and Cider House on the way to the next stop, only to find the door shut. When The Ewing saw the guy inside holding four fingers up, she confidently told me they would be open in four minutes. Fortunately I wasn't that pissed and realised he probably meant four o'clock, something a quick Google search confirmed. As we were an hour early it was back to the Green Man for a scoop first. 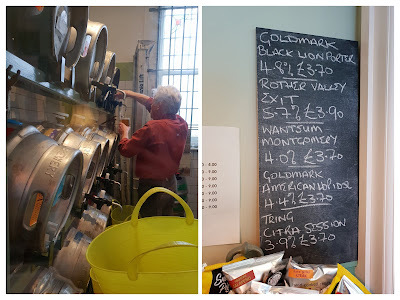 Landlord Les was very helpful when we asked which beers were local, with Goldmark down the road in Arundel being the choice for both of us - the Black Lion Porter for the Ewing and a pint (the idea of pacing myself falling quickly by the wayside) of American Hop Idol for me. 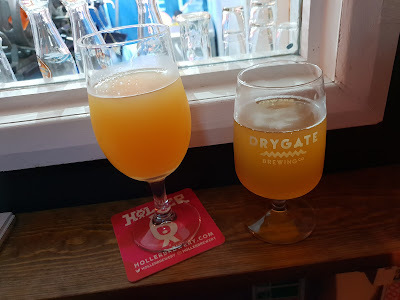 Both beers turned out to be crackers in fine condition; mine was fruity and hoppy while still sessionable, the Ewing rated it 'surprisingly good'. 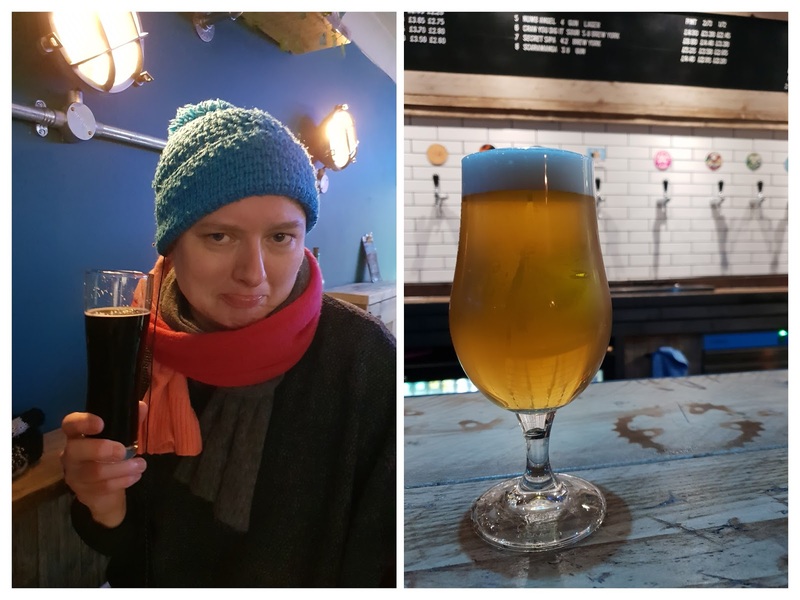 While her porter was deceptively light in colour but with a rich roasty flavour. 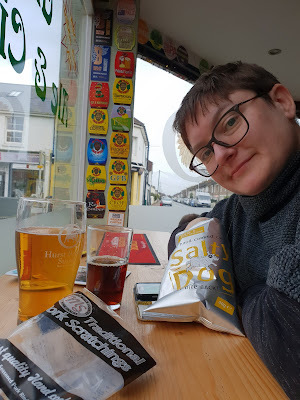 Snacks weren’t strictly local, with scratchings from the Black Country and ham flavoured crisps from Chesham, back round our way, but they were very tasty. I found the Green Man to be a wonderful curiosity (despite not being the only place like this we would visit over the weekend), with a welcoming landlord, friendly patrons and a real feeling of, slightly eccentric, traditional English bonhomie. Sitting there, drinking a perfectly kept pint and eating my bag of crispy pig skin on a grey Saturday afternoon, my wife beside me excitedly reading the vidiprinter scores, was one of those small moments of intense happiness. 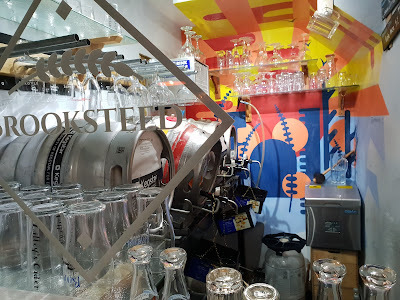 The focus was on keg beer (not sure they had any cask on our visit? 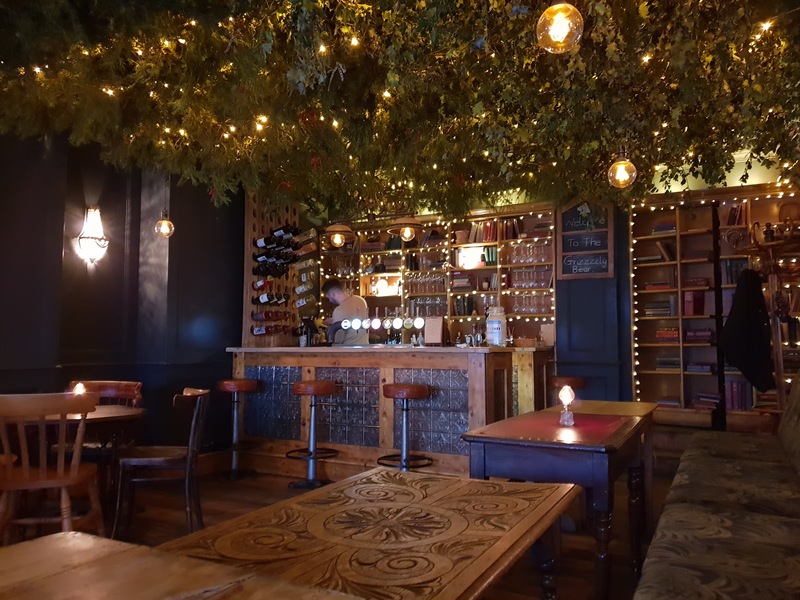 ), wine and cocktails from a succinct list. 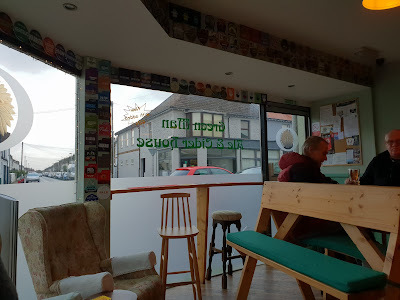 I saw Beavertown, as well as a couple of ciders and a well known Irish stout, but nothing from closer to home. 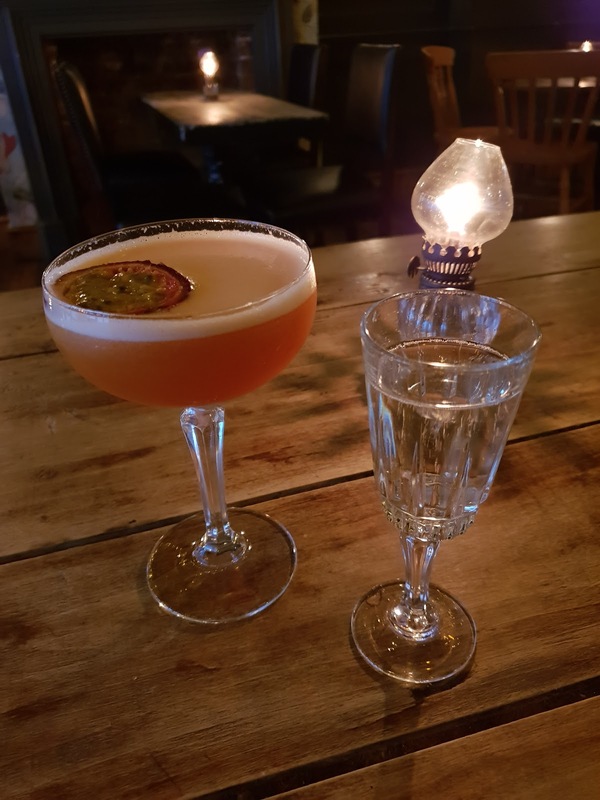 Secretly I was quite pleased as I had also clocked a mean-looking pornstar martini while looking on Instagram. Yes, I'm fully aware that passionfruit isn't native to the south coast but I decided cocktails didn't count, which was just as well as this was a pearler. 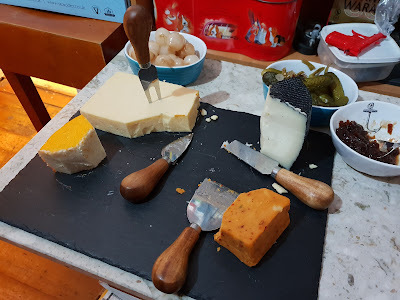 It might be a blast from the past but made like this, complete with a flute of prosecco chaser, it deserves to be revived. The Ewing also enjoyed their take on an old fashioned, which was served a little longer than usual, and also appeared a different colour, but still came with the traditional orange and cherry garnish. 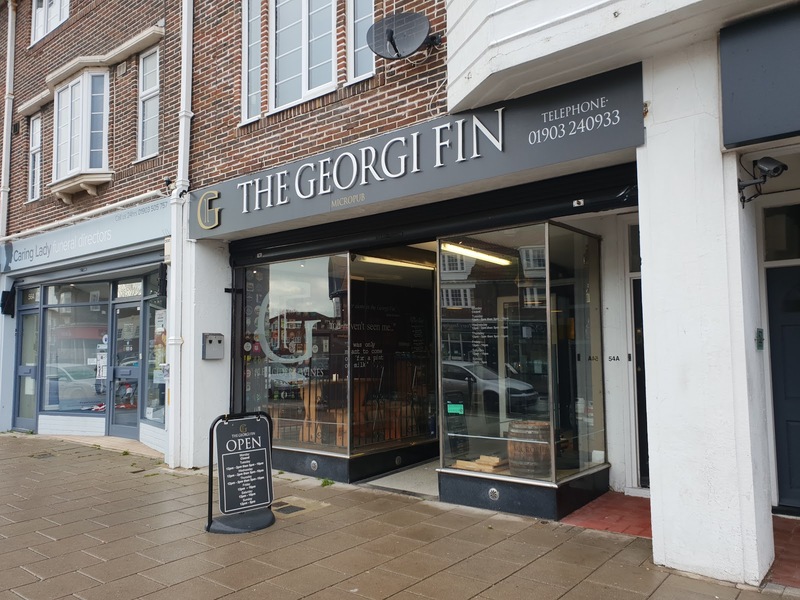 I didn't read the menu, and I can't seem to find hide or hair of it on the interweb, so I can't tell you much more than that it didn't last long. 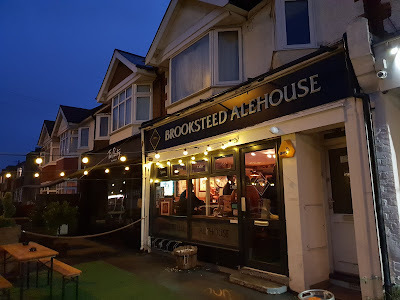 Founded in an ex hairdressing salon in 2014, the Brooksteed Ale House was named CAMRA’s Sussex pub of the year in 2016 and, judging from the crowds spilling out early on a Saturday night, it looks like it is still a firm favourite. The time it took to squeeze our way in and get to the bar was also the perfect amount for me to Google some of the unfamiliar beers on the board and ascertain which ones were local. 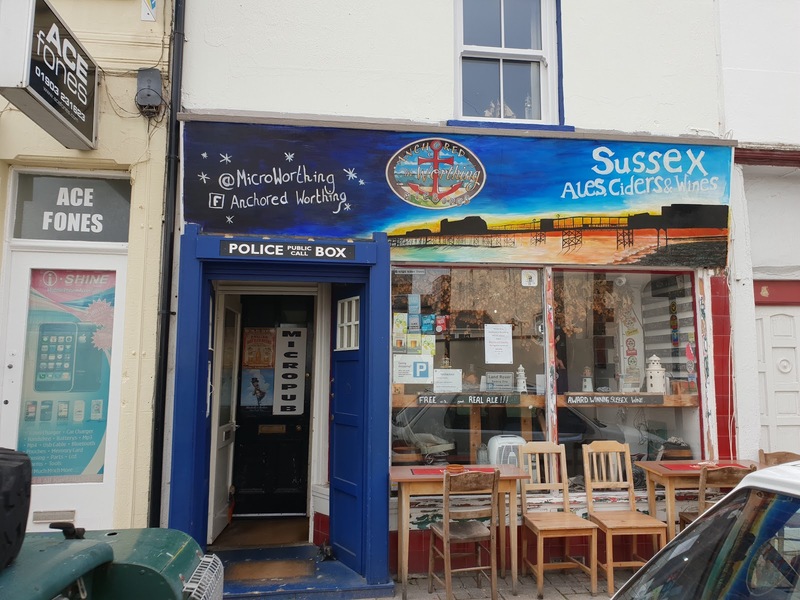 In the end the Ewing and I both went halves of Holler, formally of Uckfield but now brewing in Brighton. Um Bunko juicy pale on keg for me and Loot NEIPA on cask for the Ewing. Both these were much more of the ‘craft’ ilk than previous beers we had tried, with plenty of juicy hops, as the names suggest. 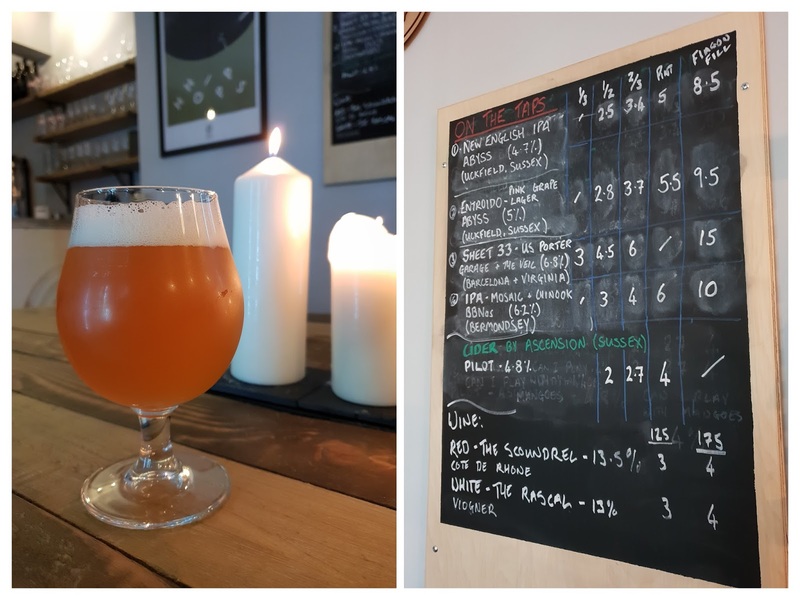 On balance I probably preferred my keg offering, as the sticky, dank fruitiness seems to work better at a slightly lower temperature and with a bit of spritz. 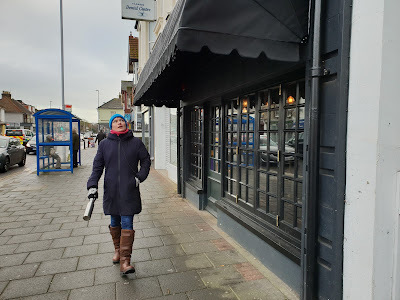 The next two stops (originally missed out, but unearthed thanks to further Googling, much to my wife’s continued delight) were to the east of town, which meant crossing the railway line (again) and negotiating an inside-out umbrella and a flooded underpass and retrieving a missing glove. Mission accomplished we arrived at Beer No Evil on the Brighton Road thirsty for round five. Or, more accurately, wet and bedraggled and pretty pissed, but at least not pissed off with each other (at that point, anyway...). 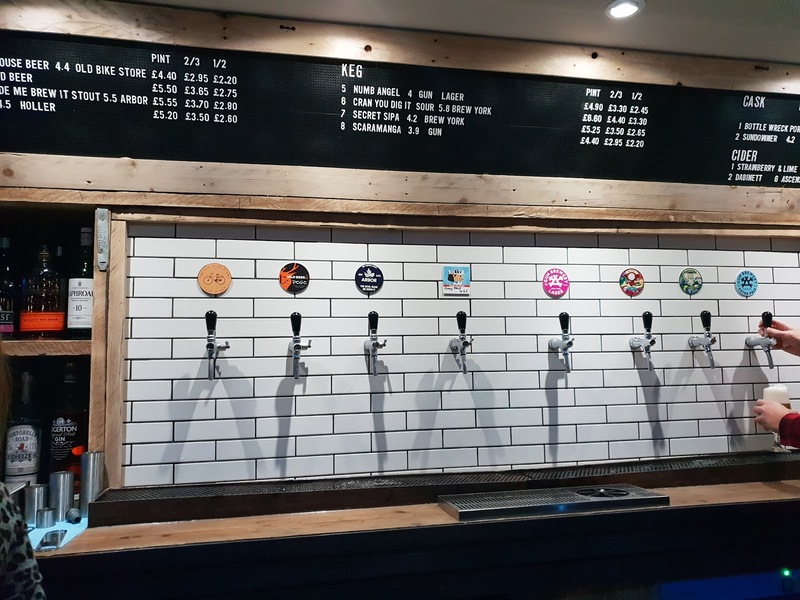 Pitched somewhere between micro pub and bottle shop this was possibly the best range of beers we saw to takeaway (and drink in) including the beer du jour on Instagram the weekend we visited, Verdant’s Putty. 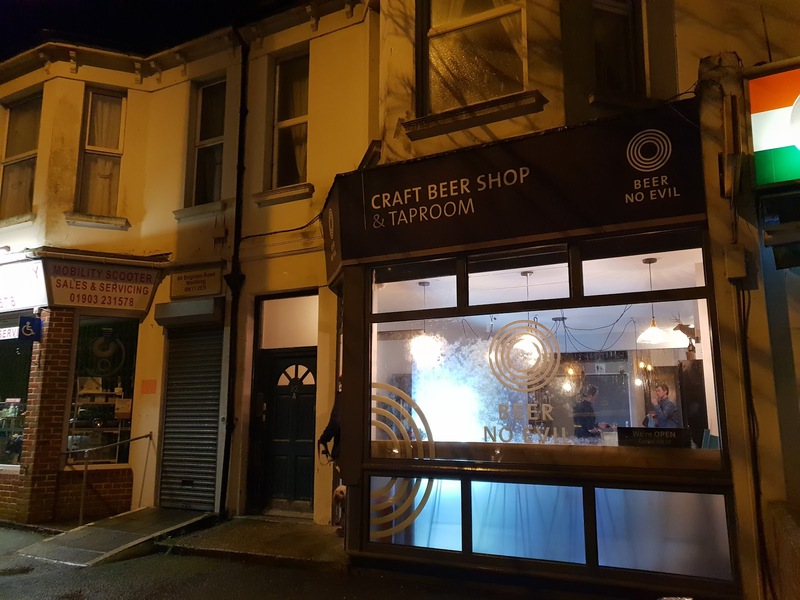 There was also a full range of Unbarred cans (brewed in Hove), and a good selection of Burning Sky and Kernal in 750 ml bottles. 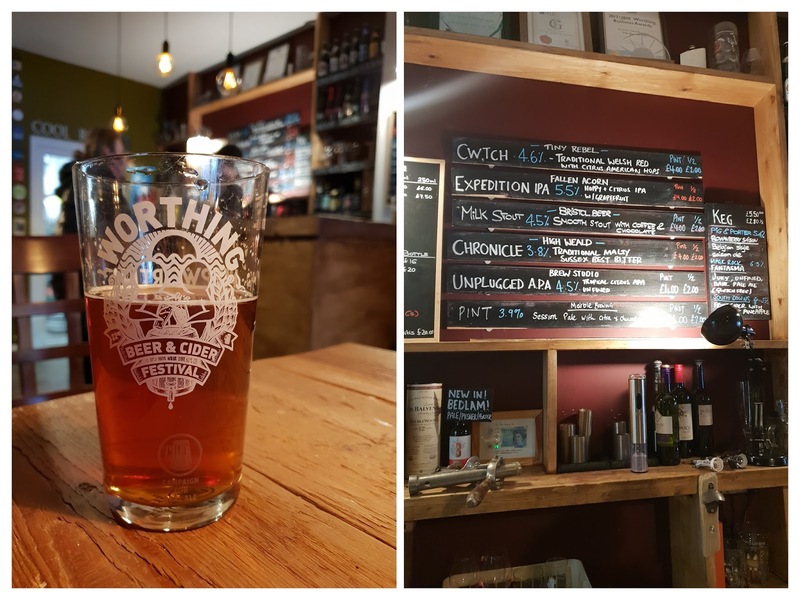 I had a schooner of the new English IPA, brewed by Abyss in Lewes, which is their take on a NEIPA, but brewed with all English hops and malt. I wish I was in a position by that time to tell you something illuminating about how it tasted, but I wasn't. Certainly looks good from the pics, though. 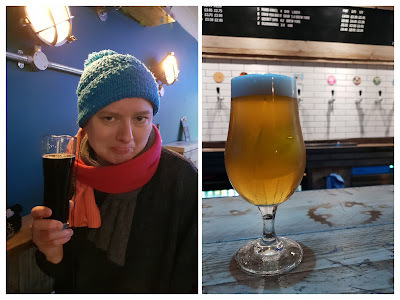 The Ewing went for the only lager (kolsch) of our trip, a schooner of Entroido, an unusual pink version also brewed by Abyss and made with Sussex grapes and malt and Spanish hops. 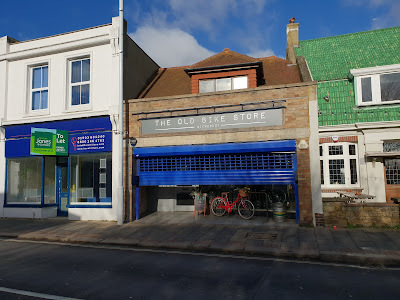 Again, who honestly knows if she enjoyed it by this point, but her expression suggests it was going down ok.
Onwards, to our next stop, the Old Bike Store, also on the Brighton Road. 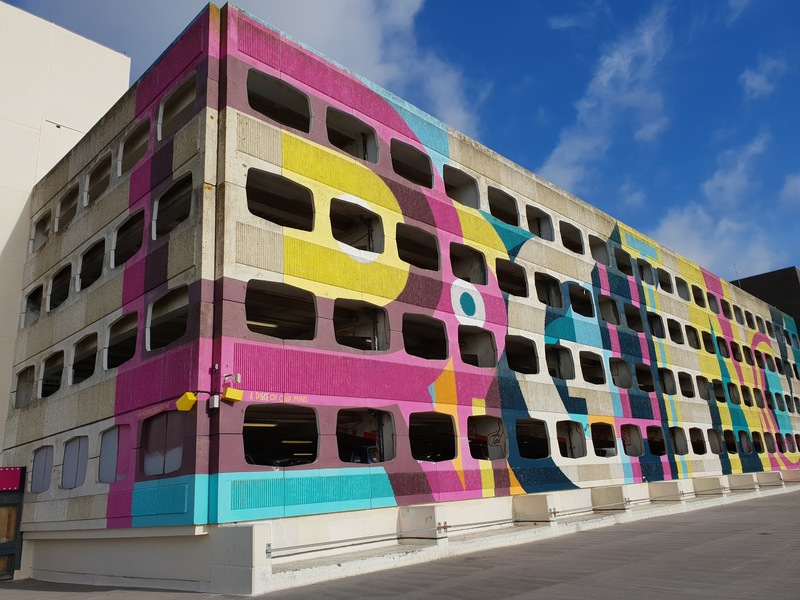 The eagle-eyed amongst you may notice the picture was taken in the daylight. No, we didn’t pull an all-nighter but when we arrived there were a gaggle of smokers by the doorway sheltering from the rain, so I decided to take a pic on the way out. And then promptly forgot. 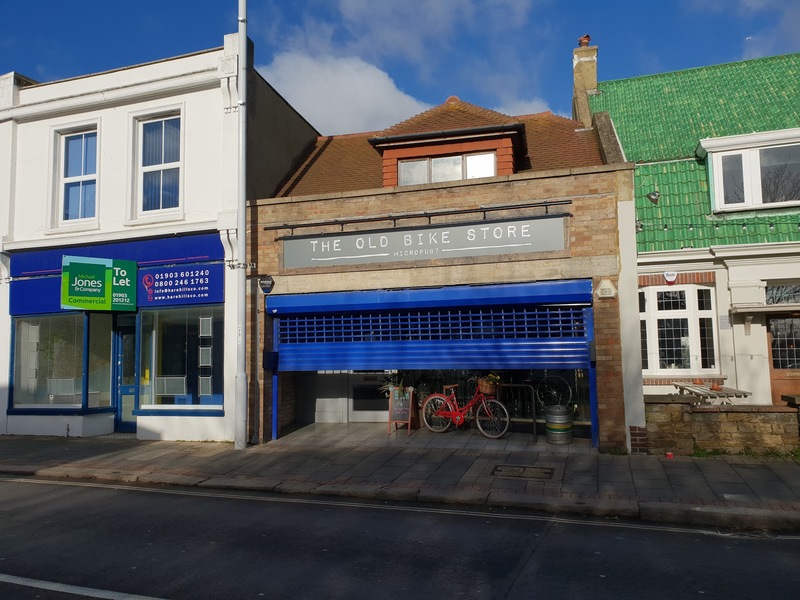 Previously an actual bike shop, the long, skinny space seemed a bit sterile at first but overall I really enjoyed the whole OBS experience. 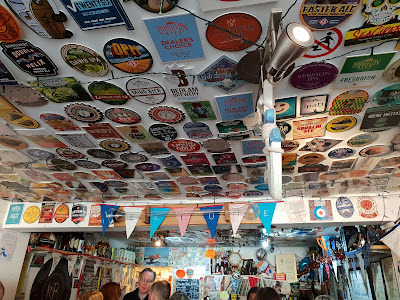 Especially the pristine tiled bar area and the friendly, knowledgeable staff who were happy to make local recs. 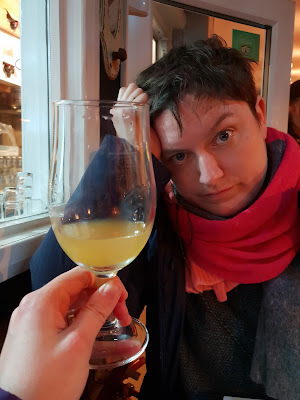 I'm not even sure what the Ewing even drank, judging from the picture I'm going to say Arbor's The Devil Made Me Brew It, but whatever it was I know she enjoyed it more than her face suggests. I would also like to thank her for patiently drying my jacket on the portable heater without managing to scald herself or my clothing. An impressive feat at this point. The following day heralded the final stop on the tour, Anchored in Worthing, the doyenne of micropubs in the town and also its first, opened in August 2013 . 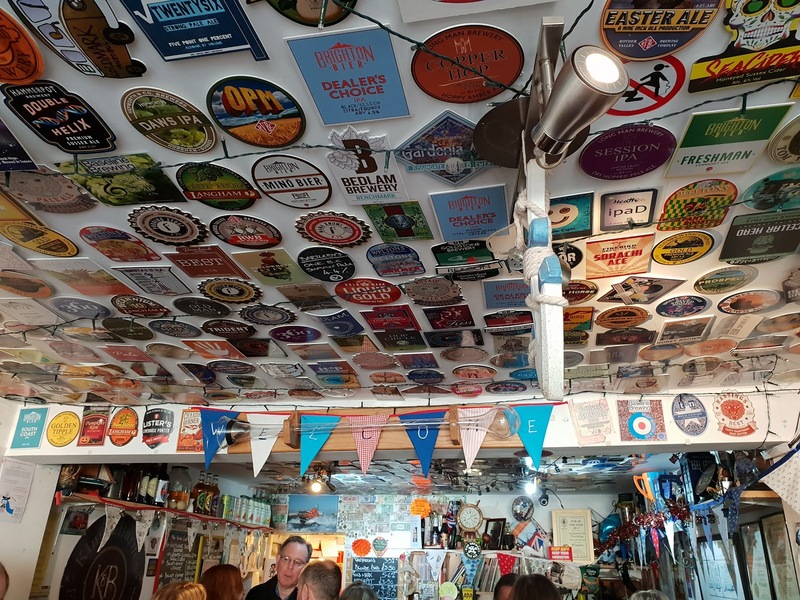 Described by landlord Nigel Watson as a ‘one room pub with no music, no gaming, machine or pool tables, no food not even a bar', walking in on a busy Sunday afternoon to a scene of happy people, excitable dogs and good conversion, it’s everything you hope a micropub would be. All the three cask ales on the board were local and luckily they also offered flights, so I didn't have to make any difficult decisions. 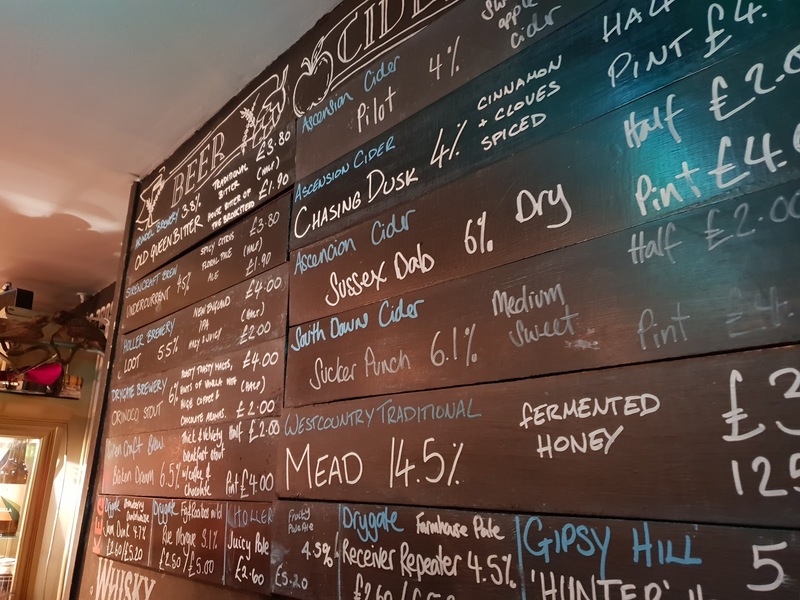 In fact everything they offer here is Sussex-centric, from the ales, ciders and perries to local wines of all hues from Bolney Estate and Nutbourne with their Nutty brut at a very reasonable 30 quid a bottle. As promised there was a fine looking cheeseboard, along with crackers and pate and chutney and pickles. 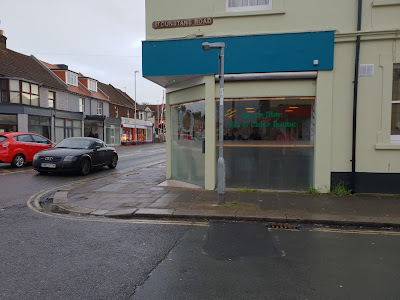 Sadly, after our lunch we had both eaten at the nearby Crabshack, neither of us could manage a slither, despite much good-natured encouragement persuading us to get stuck in. 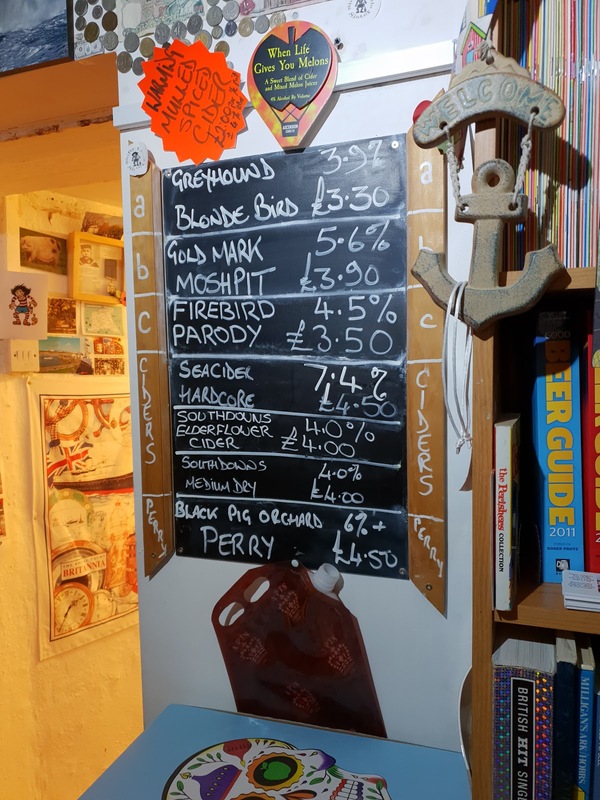 Alongside the third Goldmark beer of the weekend, the Moshpit IPA, I tried the Blonde Bird golden pale ale from Greyhound in West Chiltington and the Parody session IPA from Firebird from Rudgwick, Horsham. 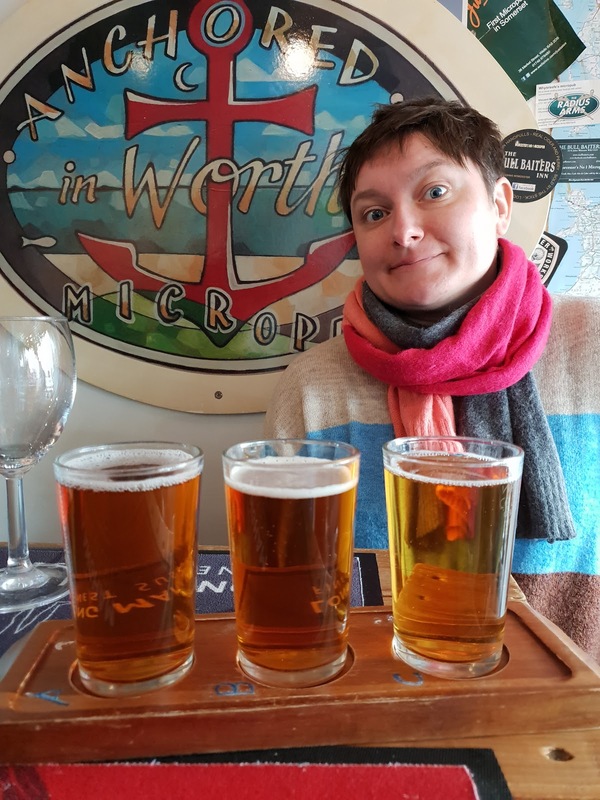 My hangover plus the glass of wine I had already imbibed put the breaks on me ordering another, but the lady we got chatting to had the right idea; order a flight then order a pint of your favourite as a chaser. 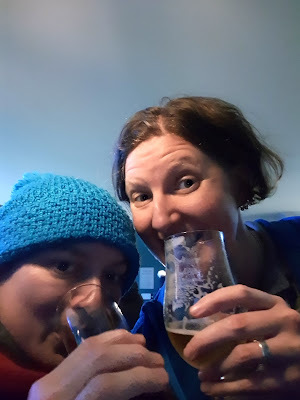 In this case we both agreed on Goldmark, my standout brewery of the trip. The Ewing stuck with soft drinks, but didn't feel short-changed with her Folkingtons hot ginger beer. 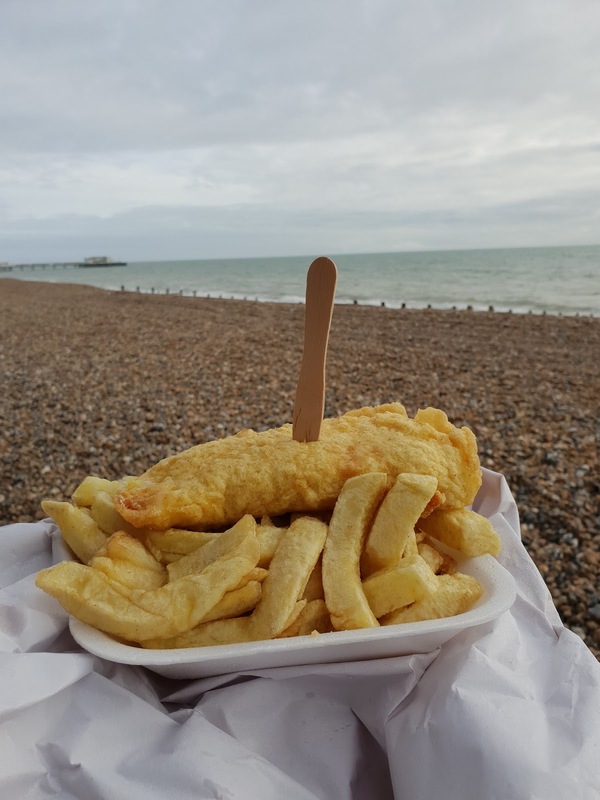 While my wife would probably describe me as far too anti-social for micropubbing I thoroughly enjoyed our experience, Despite the fact I actually had to talk to people, including my wife… Only joking darling, I loved the sea air, Sussex ales and even the socialising.